MH Magazine WordPress Theme is a clean, modern, fully responsive and seo optimized premium magazine WordPress theme for news websites, online magazines, blogs and other editorial related projects. This magazine WordPress theme includes custom widgets, advanced layout options, easy to use theme options, colorpickers with unlimited colors to create your own color scheme and many more. MH Magazine WordPress Theme is the perfect solution for bloggers, journalists, editors and seo experts who want to create fantastic and effective online magazines and focus on publishing amazing content to expand their business. Stop tweaking your current WordPress theme and wasting your time searching for inefficient plugins. All options and features of MH Magazine WordPress Theme can be configured and customized very easily within a few minutes. MH Magazine is one of the most popular magazine / news themes for WordPress used by thousands of customers from more than 110 countries around the world. We welcome you to be part of our growing community! MH Magazine has been coded with care by using valid HTML5, CSS3 and PHP code. The theme has also passed the professional review process by WordPress Theme Reviewers. The layout of this magazine WordPress theme is fully responsive and looks great on desktop and mobile devices like iPhones, iPads or other smartphones and tablets. With the included layout options you have full control over your layout and you can modify the look of your site, change the sidebar position or even enable a second sidebar. MH Magazine WordPress Theme includes the popular responsive FlexSlider 2 with touch control on mobile devices and desktop computers with touchscreen. MH Magazine has included a collection of the most popular Google Webfonts. Change fonts for headings and text very easily with only a few clicks in the options panel. MH Magazine WordPress Theme has been coded while keeping SEO best practices in mind. Benefit from a solid fundament for good rankings in search engines. MH Magazine has in total 26 widget locations available where you can place standard WordPress widgets, custom widgets, advertisements or anything else. You may customize MH Magazine WordPress Theme as you like. Files to create a basic child theme are already included in the download package of this WordPress theme. MH Magazine WordPress Theme is translation ready and can be translated very easily. This theme also supports languages written in a Right-To-Left direction (RTL Support). WordPress 4.9+ ready, support for all modern browsers (IE9+, Firefox, Chrome, Safari, Opera) and also tested to work flawlessly with WordPress Multisite Installations. Depending on your chosen plan you have free theme updates and excellent theme support through our professional helpdesk included. For more information view pricing. MH Magazine WordPress Theme is distributed under the terms of the GNU GPL license. You may customize and modify this WordPress theme as you like. In case you need theme customizations or other modifications, feel free to contact us and we’ll be more than happy to send you a quote based on your requirements. MH Magazine WordPress Theme provides a collection of awesome custom widgets and flexible layout options to create content rich and professional layouts without coding skills. This modern magazine theme for WordPress comes with a widgetized template that contains several widget areas where you can place widgets, advertisements or else. To show what is possible with this flexible magazine WordPress theme, we’ve created several demos with examples of how you could use this magazine theme for any editorial purpose or content genre and create modern online magazines, dynamic news websites, professional blogs or any other editorial websites. All the demos below have been created with the MH Magazine WordPress Theme just by using the layout options and custom widgets that are included in the theme. The standard demo of MH Magazine WordPress Theme shows how this magazine theme can be used for modern online magazines or dynamic news websites with topics like politics, finance, world news, business, economy or anything else. Using the widgetized front page and the flexible layout options you can create news websites or online magazines with endless possibilities. The lifestyle demo of MH Magazine WordPress Theme shows how this beautiful and modern magazine theme can be used for online magazines with topics like lifestyle, travel, entertainment, culture, arts or any other content genre. This demo is just an example of what is possible with MH Magazine and you are free to arrange the widgets as you like to create your preferred layout. The technology demo of MH Magazine WordPress Theme shows how this modern magazine theme for WordPress can be used for content rich online magazines or news websites with topics related to technology, internet, gadgets, science or anything else. This demo nicely shows how you can use the flexible layout options to convert your site into a wide layout with two sidebars. The news demo of MH Magazine shows how this popular magazine theme can be used for dynamic news portals and vibrant news magazines with topics like politics, business, economy, international and national events or incidents. To create professional and dynamic news websites you can arrange widgets on your front page in various different ways and prominently display your content. The food demo of MH Magazine WordPress Theme shows how this magazine theme can be used for stylish websites with topics like food, gourmet, recipes, restaurants or cooking. With this flexible and appealing magazine theme you can create attractive and fresh looking food blogs or online food magazines by using the various integrated custom widgets, useful options and features. The travel demo of MH Magazine WordPress Theme shows how this magazine theme can be utilized to create editorial websites about traveling, city trips, sightseeing or else. With this flexible, SEO optimized and fully responsive magazine WordPress theme you can create beautiful travel online magazines, travel blogs about your journeys or professional websites about traveling. The sports demo of MH Magazine WordPress Theme shows how this magazine theme can be used for websites about sports, sport events or sport clubs. With this magazine WordPress theme you may present latest news appealing and reader friendly by taking advantage of the fully widgetized front page where you can easily place flexible custom widgets in a nice and organized way. The feminine demo of MH Magazine WordPress Theme shows how this magazine theme can be utilized to create beautiful and feminine online magazines about fashion, beauty, lifestyle or other ladylike topics. With this popular magazine theme you can choose from unlimited colors to set your preferred color scheme, use plenty of options or place custom widgets to organize your content. The dark music demo of MH Magazine WordPress Theme shows how this magazine theme can be used for websites related to music, bands, concerts and other topics related to the music or entertainment industry. This flexible magazine WordPress theme allows you to configure cool dark themed websites to present rock bands, new albums or inform about concerts and events. The wildlife demo of MH Magazine WordPress Theme shows how you could utilize this magazine theme to create editorial online presences for wildlife foundations, professional online magazines about zoology, geography, environment or other magazines or news portals related to nature, science, animals or wildlife. This magazine theme is ideal to create professional online magazines. The motorsport demo of MH Magazine WordPress Theme shows how you could use this magazine theme for websites about motorsports, racing, motocross, motorbikes, rallye or else. With this flexible magazine theme you can create dynamic online magazines on all kinds of adventurous action sports. Present recent sports news or breath taking content in a nice and organized way. The urban style demo of MH Magazine WordPress Theme shows how you could use this theme for cool urban style online magazines about lifestyle, streetart, design, photography or else. MH Magazine is ideal to create sophisticated online magazines with an urban, fancy style. You can create websites with an individual touch by taking advantage of the included custom widgets. The vintage & retro demo of MH Magazine WordPress Theme shows how this popular magazine theme can be utilized to create editorial websites about vintage and retro lifestyle, fashion, photography, culture, nostalgia or else. This flexible magazine layout is ideal for online magazines and blogs about all kinds of topics related to modern retro living or the good old vintage way of life. The health & fitness demo of MH Magazine WordPress Theme shows how you could use this magazine theme for websites with topics like health, fitness, sports, nutrition, wellness or anything else related to an active and vital lifestyle. Using this fashionable magazine WordPress theme, you can present your content in an attractive way and publish content about latest health and fitness trends. The education style demo of MH Magazine WordPress Theme shows how you could use this theme for professional online magazines for colleges, universities, schools, research facilities or other educational institutions. 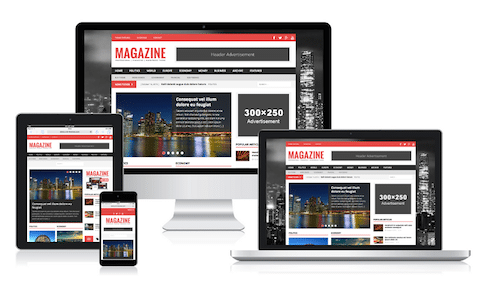 This modern magazine WordPress theme allows you to launch well-organized online magazines to display information and news from your departments or relevant disciplines. We are more than happy to provide quick and helpful theme support to all customers who have purchased Premium WordPress Themes by MH Themes. Theme support through our professional helpdesk includes answers to all theme related questions and general basic WordPress support. Our support staff usually will answer your questions within 24 hours. In case of theme customizations or custom development it’s possible to request a free quote based on your requirements.